Weston A Price, the famous dentist and natural health pioneer, whilst travelling amongst the worlds differing populations in the early part of the last century discovered that those eating traditional diets seemed far less prone to killer diseases and tooth decay. He speculated that some nutrient (as yet unknown to him) was at work. 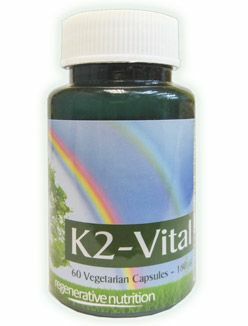 We now are pretty sure that it was Vitamin K2; officially "discovered" in 1929 by German scientists. Vitamin K2 is accumulating a sizeable body of clinical evidence illuminating its vital importance in combating 2 of the most common chronic diseases of our age; osteoporosis and cardiovascular disease. Cardiovascular disease is amongst the top killer diseases on the planet and both diseases are now clinically proven to be connected with Vitamin K2 deficiency. Extremely complimentary to Vitamin D3 to help with maximum mineral absorption; aiding in the prevention of bone, tooth and gum decay. Very important for the arthritic diseases. Vitamin K2 supplements interfere with the activity of oral anticoagulants such as Warfarin. Those who are using Warfarin (or similar oral anticoagulants) should only use vitamin K2 supplements with the knowledge of their prescribing health professional. People on oral anticoagulants will likely be advised to limit their K2 intake to amounts typically found in the diet. Otherwise, there is no known toxicity associated with vitamin K2. HealthLine have recently posted an interesting and evidence based article on Vitamin K2. Please click here to open in a new browser window. The Weston A Price foundation has extensive information. Please click here to open in a new browser window. The Linus Pauling Institute's Micronutrient Information Center of Oregon State University have an in-depth article here. This is a more cautious and scholarly article, but still has some useful information. Vitamin K2 is vital for mineral absorption. It is useful in almost every health condition* and as a preventative measure. *Those with conditions that cause (or have as a symptom) thinning of the blood should not use Vitamin K2 supplements without referral to their healthcare professional.